As we are approaching cooler weather, you may be losing hope that your tomatoes will turn red. Cooler weather is one of the causes for your tomatoes not turning red, resulting in a garden full of green tomatoes. When the temperature is between 50 and 85 degrees, tomatoes produce the chemicals lycopene and carotene which turn tomatoes red. So the colder the weather gets, the more likely your tomatoes will stay green. Of course you can throw your green tomatoes into the composter, but before you cut your losses why not try one of these recipes? 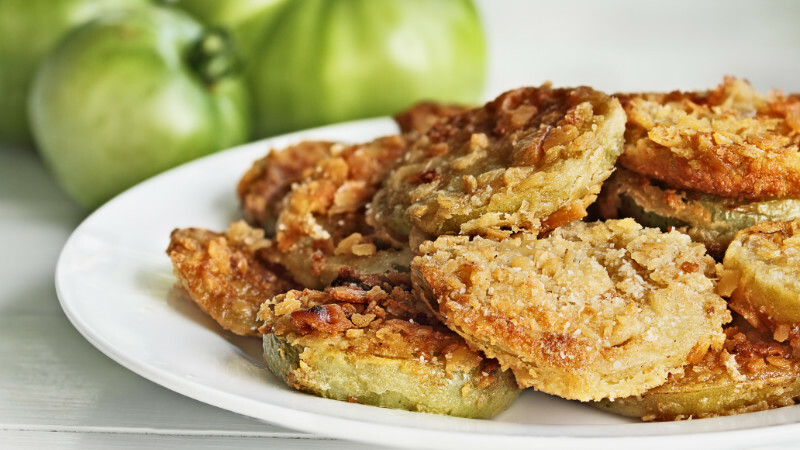 This classic recipe is the most common and delicious use of green tomatoes! This southern comfort food is a favorite in any home regardless of where you live. Give it a try and you’ll be surprised. 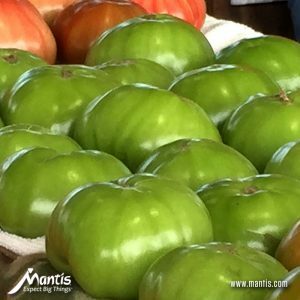 Turn green tomatoes into the perfect comfort food! In a shallow bowl, mix all the dry ingredients: 1/2 cup of cornmeal, 1/4 cup of flour, 1 teaspoon of pepper, 1 teaspoon of salt, and 1 teaspoon of garlic powder (optional). In another shallow bowl, combine the egg and ½ cup of buttermilk. Then place the remaining 1/4 cup of flour in a shallow bowl. Place the skillet on medium heat and coat it with 1/2 cup of oil. Like an assembly line, cover the tomatoes with the flour, dip in the egg mix, and then dip in the cornmeal mix. Once pan is hot, pan-fry the tomatoes. You want to cook the tomatoes for about 3 minutes on each side or until golden brown. Once the tomatoes are crispy on each side, carefully remove and place on paper towels or a rack to drain. Serve with hot sauce. Salt, Pepper, and flour THINLY sliced green tomatoes in oil in a frying pan,brown on both sides with a nice crunchy outside.Don’t cook too fast so they get cooked through about med heat. I never used egg or buttermilk. The biggest mistake I see is people slice them way too thick and they are raw in the middle and too soggy.Slicing them thinner ensures they get done and they taste awesome.A touch of Soul seasoning is nice too. Wow you never use egg or buttermilk? So just salt, pepper, and flour – I think I might have to try this. Definitely healthier version! This is the way I have fried tomatoes for 60 plus years. I never had a complaint when I share them. My Mom used to do almost the same BUT she dipped the slices into the liquid then flour twice to give a crispier treat. Tomatoes can easily be grown in pots on the porch or deck. That sounds delicious. I actually prefer a crispier treat. I will give this a try next time! When all else fails and you still have way too many tomatoes, give them away. It shouldn’t be too difficult to find someone willing to take extra tomatoes off your hands, and it will be a relief to know they aren’t going to waste. You may even be able to donate fresh tomatoes to a local food pantry. This sounds like the recipe I have used for years, except I mix all the dry ingredients together, dip the thick tomato slices in, cover on both sides. Then I saute in butter and olive oil until just right. Also, I use tomatoes that are just turning from green to orange. The best!